What does the '*' sign next to the date indicate? The '*' sign next to the date indicates that the stats are un-audited i.e. the stats are estimated. The '*' sign will be removed once we receive the actual domain wise stats from our providers. Our upstream providers usually takes around 24 to 48 hours to provide the actual numbers. What is the difference between 'Audited' and 'Un-audited' stats? DomainAdvertising.com has partnerships with more than 120+ ad feed providers and several direct advertisers. Since updated data from all providers is only available in 24-48 hours, our system shows estimated stats or 'Un-audited Stats' on the Reporting Interface. Un-audited stats are always marked with an asterisk '*' next to the Date. Once data from all ad feed providers is available, our system compiles all updated data and calculates your earnings. This audited data is then updated on the Reporting Interface. How can I check stats for a list of domains? On the 'Reports' page, click on the link 'Multiple Domain Stats'. 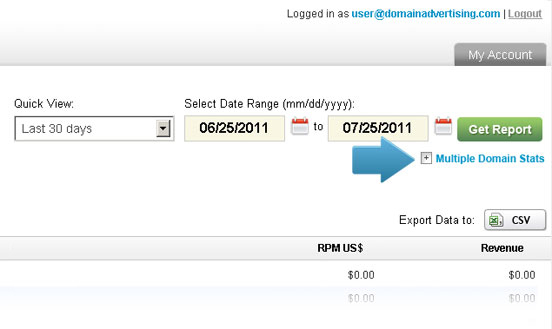 Select the required date range and paste the list of domains in the text box provided. 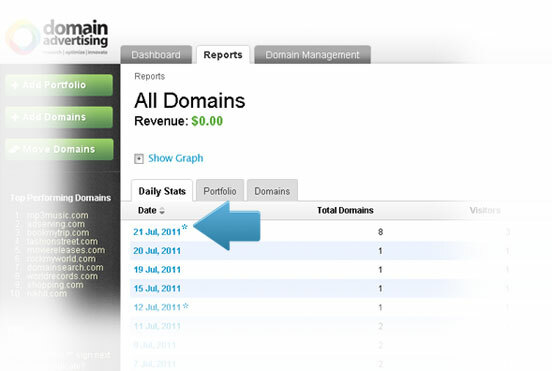 Click on 'Get Report' to get daily stats for the selected domains.